The Union Cabinet has displayed neither competence and capacity nor seriousness and sincerity in addressing the problems being triggered by its decision to bifurcate Andhra Pradesh, charged Lok Satta Party national President Dr. Jayaprakash Narayan here today. Addressing a media conference, Dr. JP said the Andhra Pradesh Bifurcation Bill cleared by the Union Cabinet along with amendments on February 7 is a total disappointment. It has singularly failed to adopt the specific, constructive and practicable solutions offered by the Lok Satta Party in its representations. The Union Cabinet has let down people as also their representatives by going back on its promise to incorporate provisions that ensure a bright future for all Telugu speaking people. Dr. JP said the Bill has not addressed the huge revenue deficit the residuary Andhra Pradesh will face consequent to Hyderabad city becoming part of Telangana. While Hyderabad city enjoys a revenue surplus of Rs.13,000 crore, the residuary Andhra Pradesh has a deficit of Rs.7000 crore going by 2012-13 data. The deficit is expected to shoot up to more than Rs.10000 crore in 2014-15. The Union Government which has caused the problem because of its decision to bifurcate the State is duty bound to provide a solution too. 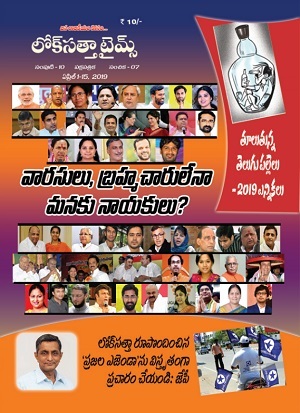 If the Union Government is serious, it should earmark funds for at least a decade from the Consolidated Fund of India to the residuary Andhra Pradesh towards meeting its deficit and make a beginning by making allocation in the Vote on Account budget to be introduced in Parliament soon. The Lok Satta, he recalled, had suggested that backward Rayalaseema and North Coastal Andhra regions be treated on par with Special Category States and extended all excise duty and corporate income tax exemptions and provided other incentives like investment and freight subsidies to promote industrialization. Dr. JP said that the incentives given to Special Category States could be extended to backward regions through a simple executive order. But no such commitment is made in the law. The Center should concede the demand of people of Kurnool and Ananthapur districts for their merger with Telangana State and assuage their fears over river waters etc. The Center has rightly chosen not to merge Bhadrachalam town with residuary Andhra Pradesh complying with people’s wishes. Why does it not extend the same logic and concede the near unanimous demand of Kurnool and Anantapur people and their representatives? Dr. JP pointed out that there has been no firm commitment from the Center on improving infrastructure facilities in Andhra Pradesh. 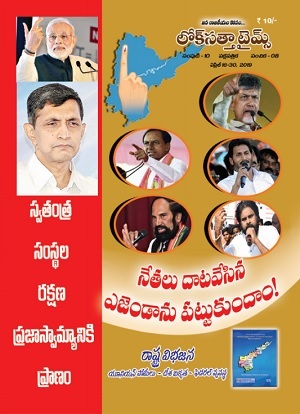 It has promised to merely examine or consider all the suggestions relating to development of Ramayapatnam and other ports, establishment of steel plants, building of aVisakhapatnam-Chennai industrial corridor, creation of Visakhapatnam railway zone residuary Andhra Pradesh, development of Metro Rail facilities in Visakhapatnam and Guntur-Tenali-Vijayawada areas, and the establishment of a green field oil refinery. The Bill cleared by the Union Government is again silent on amending the Constitution to provide safety and security of people in Hyderabad hailing from other region. It has not incorporated even suggestions made by the State Governor. It merely entrusts the Governor with law and order responsibilities in Hyderabad, which is constitutionally questionable. The only two demands of Lok Satta incorporated in the Bill are transferring in submission areas of polavaram project is residual AP, and ensuring execution of surplus water defendant projects in Rayalaseema and Telangana regions. A categorical, legally-binding commitment to meet the revenue deficits of Residual AP from Consolidated Fund of India. Tax exemptions to promote investments in Rayalaseema and North Coastal Andhra, on par with Special Category States. Merger of Ananthapur and Kurnool districts in Telangana State. Irrevocable commitment to build the infrastructure projects in the Thirteenth Schedule of the Bill with central funds in a period of five years. In addition, stronger legal mechanisms to protect the rights of all citizens in and around Hyderabad city should be incorporated to assuage fears and concerns about economic security. If the Union government is sincere about its commitments to Telugu people, it should honour them in deed, instead of indulging in lip sympathy. If the government does not act on these issues, it must be construed that the Congress party and the Union government are only interested in cynically manipulating people’s psyche for electoral gains, and in indulging in gamesmanship at the cost of all regions of AP. Replying to a question, Dr. JP unequivocally rejected any electoral tie-up with the TDP or other traditional parties since all of them believe in politics of dynasty and money power, espouse disastrous economic policies and are equally responsible for the current political mess in the State. He also ruled out Lok Satta alliance with AAP which is pursuing juvenile politics in its governance. Asked if he was contesting for the Lok Sabha from Malkajgiri, Dr. JP said the question is premature. The focus now should be to resolve the crisis in the State in an amicable manner by a win-win approach. Electoral politics will come later, and are of very little consequence at this stage. Dr. JP disclosed he is in touch with MPs from the State as also top BJP leaders on ensuring that the Bill addresses all the problems raised by the Lok Satta. Lok Satta leaders M. Satyanarayana, P. Sivaji and I. Anantalakshmi took part in the media conference.